We've all heard of the "crazy cat lady" but what about the crazy cat men? There must be some out there. 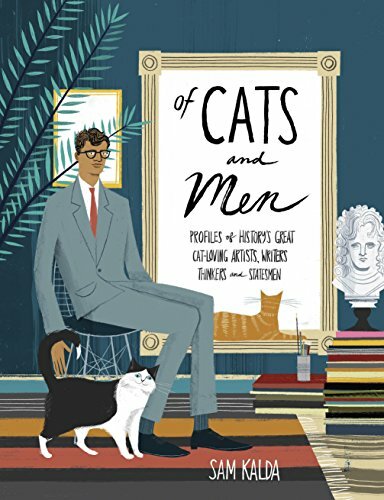 Author Sam Kalda takes a look at some famous men throughout history who loved their feline friends in Of Cats and Men. Starting in the 10th century with Welsh King Hywel the Good (who recognized the value of cats as cheap vermin controllers and therefore protected them through law) on down the centuries to the present day, many influential men have been inspired, amused and comforted by cats. This colorful book takes a page to describe the man in question, his history, and his connection to cats. Each page also includes a drawing of the man and his inspirational cat. There are many cat-admiring quotes sprinkled throughout the book as well. Anyone who loves cats will be entertained by the many achievements of cats -- while their owners may take credit, it's really the cats who were responsible for inventing the cat flap (Sir Isaac Newton), alternating current (Nicola Tesla) Companion cats have also inspired poetry, musicals, art and even dance performances. It was also somewhat surprising for me to learn that somewhat stereotypically "gruff" men, including Ernest Hemingway, Mark Twain and Winston Churchill are among the famous cat lovers. You can even follow some of the more outgoing modern cats on social media. This book is a charming look at how cats have been loving, loyal and amusing companions to some of history's greatest leaders, artists and scientists. Those ancient Egyptians, who revered cats as gods, were certainly on to something!